Canadian astronaut Chris Hadfield shows just what happens to a wet washcloth in space when you wring it out without the help of gravity. The result: a "tube" of water. Hadfield demonstrated the phenomenon as part of a student experiment on April 16, 2013. It's a fact of life: When you've got a mess, you'll likely need a washcloth to mop it up. But what if you live hundreds of miles above Earth and float in weightlessness? That's precisely what the student winners of a Canadian Space Agency contest wanted to know, and they turned to astronaut Chris Hadfield to find out the answer. The students, Meredith Faulkner and Kendra Lemke of Lockview High School in Fall River, Nova Scotia, designed an experiment to learn would happen when you wring out a soaking wet washcloth in microgravity. "The question is, if you get a cloth dripping wet without gravity and you wring it out, what's going to happen?" Hadfield said in the space washcloth video. "What will happen to a wrung out cloth?" 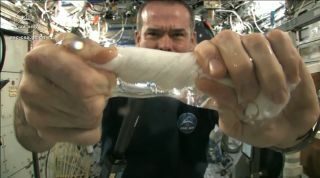 Hadfield used some drinking water to soak the cloth through, catching the bubbles of water created by microgravity with the hand towel. Then, he began to wring it out. As Hadfield squeezed water from the dripping cloth students on the ground let loose with "oohs," "ahhs," and some laughs, as the water stayed put instead of falling away like it would on Earth. Instead of dripping, the water formed a strange, wet bubble around Hadfield's hands. The more Hadfield wrung out the cloth, the larger the bubble of water became. "It's becoming a tube of water," Hadfield said as he held up the cloth to the camera. "The water is all over my hands, in fact, it wrings out of the cloth into my hands, and if I let go of the cloth carefully, the water sort of has it [the cloth] stick to my hand." Hadfield also showed off some of the space station's smallest equipment. "We might have the coolest washcloths ever here on the space station," Hadfield said as he pulled out a small cylindrical "hockey puck" smaller than the palm of his hand. Hadfield explained that in order to save space, engineers have manufactured various items in the smallest way possible, and the washcloth is no exception. Hadfield is one of six residents currently living and working on board the International Space Station. He is joined by two NASA astronauts and three Russian cosmonauts. NASA's Tom Marshburn and Russia's Roman Romanenko will fly back to Earth with Hadfield in May after six months on board the orbiting outpost.